This is a side-scrolling shooter played in a world created from the mind of a twisted demon. 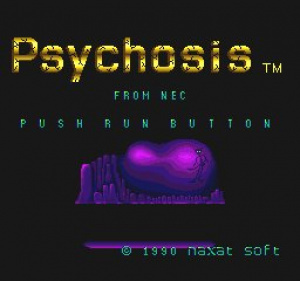 The PC Engine/TG-16 is a machine that is famous for its wide and diverse range of shooting titles, but Psychosis (also known as Paranoia in Japan) is one title that you might not be familiar with, despite the fact that it was deemed worthy of a Western release back in the day. We also like to see originality here at VC:R and the plot for Psychosis is about as innovative as they come. The concept is that your body has shut down and your mind is slowly dying, but your subconscious decides that it’s not giving in without a fight and therefore ‘creates’ a spaceship-style craft that is then sent into the dark recesses of your mind to flush out all nasty monsters hiding there. 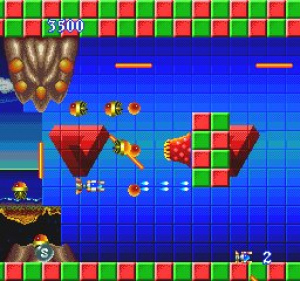 This plot has given the designers free rein to come up with some seriously wacky enemy and level designs (some of which remind us of Bio Hazard Battle, another VC shooting title), and this undoubtedly sets the game apart from the millions of other shooters available on NEC’s 8-bit machine. However, the innovation doesn’t end there. 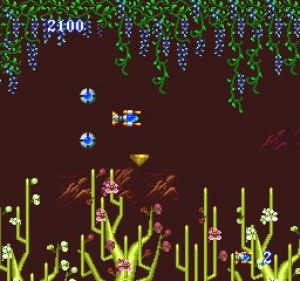 The game also showcases a unique weapons system, where the player is granted two defensive orbs (very much like the Force power up seen in Irem’s seminal R-Type) that not only have the ability to absorb enemy fire but can also be upgraded. For example, one pickup gives the orbs a lightning-flash attack that can wipe out enemies and also defend against bullets. 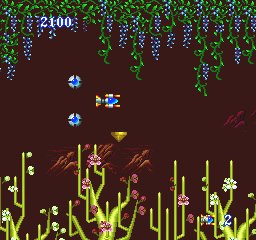 These orbs can also be rotated around your craft at the press of a button, which gives the game a neat tactical element often missing from other, more mindless shooters. 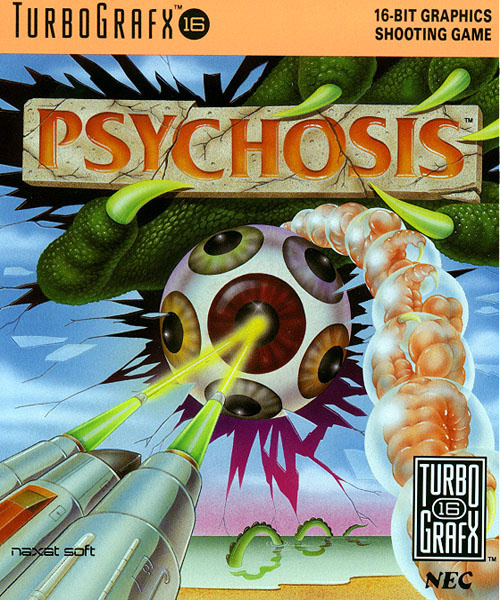 Every shooter fan will tell you that difficulty is important, and Psychosis is definitely hard – but only when you don’t have the orbs equipped. As soon as you collect them, things become a lot easier – almost too easy. The orbs are so resilient to enemy fire that when you come to face the end of level bosses the vast majority of the time all you need to do is make sure the orbs are in the closed position (so no bullets can pass through them) and keep the boss directly in front of you. There are odd moments when you make a mistake and enemy fire strays past your defences (thus rendering the game difficult again as you have to pick up another set of orbs), and this serves to unbalance the challenge a little. Psychosis is an interesting game with decent visuals and punchy sound, but it’s badly let down by the inconsistent difficulty level. There are far better examples of shooters currently available on the Virtual Console, but if you’ve sampled them all and want something a bit different, then you could do a lot worse than splash your Wii points on this little-known blaster.